Before you begin working your way to foreign language fluency, it helps to understand the culture behind the language you’re learning. After all, language exists to help a group of people express their ideas and beliefs. France is an old country with a rich history and culture. As you begin your French language program, gaining a strong grasp on this history, the values, and the etiquette will help you rapidly achieve success. In particular, when you meet a French person, you always want to make sure you follow the proper social etiquette to make a positive first impression. Exuding confidence when you meet someone in France is essential. It doesn’t matter if you are at a party, a business meeting, or a baguette stand. First impressions are crucial, and the French will judge a book by its cover. Speak clearly and with purpose. Give a firm handshake when appropriate. Make eye contact. Be sincere and don’t patronize the other person in your attempt to be friendly. At business meetings, don’t be too chummy, and don’t think you must smile from ear to ear for two hours. If you do, the French will think something is wrong with you. Likewise, don’t take it personally if your French counterparts don’t burst into smiles every time you speak. Dress professionally but conservatively. Make sure you are well groomed. Speak with conviction but express respect in every word and with your body language. Social interactions among the French are quite empathetic and inclusive. 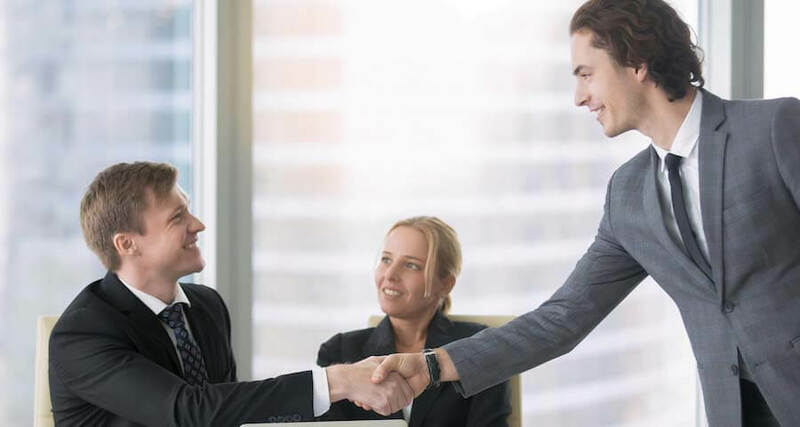 Shaking hands has grown to be a normal form of etiquette and continues the traditional logic that shaking a person’s hand was proof that he or she was not holding a dagger! To this day, it’s not uncommon for the French to shake hands upon arrival and leaving, even at work. Although fear of a dagger has become outdated, the shaking of hands seems to have, nonetheless, evolved into a form of assurance. This considerate act assures that you are an amicable and trustworthy character. For instance, you may shake hands with a friend you are meeting in a café, and shake hands again as you two depart. If your friend happens to be with a group of people, it is considered the norm to shake hands with everyone in the group, familiar or unfamiliar. You may witness someone carrying on a conversation with a person she or he is meeting while simultaneously shaking hands with everyone else in the group. To take social interactions to an even more empathetic level, often French men and women give each other a kiss on the first meeting. When in France, if in doubt about whether to shake or kiss, just go with the flow, and take your cue from the other person. Just beware that you shouldn’t expect just one kiss on the cheek. Depending on the circumstances, the number of kisses will vary from one to four! Like other Romance languages, French contains two forms of the word equivalent to the English “you.” For instance, the Spanish “tu” is informal while “usted” is formal. Similarly, the French language contains two forms of “you”: “vous,” which is the formal pronoun, and “tu,” the informal pronoun. You should always take a little time to think before speaking, as it can be quite offensive to use “tu” unless there’s some kind of invitation to use it. “Tu” represents a high level of comfort and familiarity. In English, being too formal creates distance within a relationship, but using the French “vous” is an acceptable form until familiarity is established, then you can transition to the informal “tu.” On the other hand, children and teenagers use the term “tu” with one another freely. Consultant and author David Hampshire makes it clear that “The familiar form is always used with children, animals and God, but almost never with your elders or work superiors.” Even with all the strict rules about which form of “you” to use, there are exceptions to the rules. For instance, young adults often use “tu” with one another in addition to work colleagues, which is called “tu collégial.” If the situation leaves you confused and unsure which form to use, just use “vous” with people you do not know, and they will indicate whether you should tone down the formality or maintain it. Most people agree that France has a certain way of doing things, but often wonder why. “L’exception française” is an expression referring to France’s unique perspective, and how the country plays by its own rules to protect its interests, first and foremost. Other European countries are relatively practical when it comes to solving problems and meeting goals. The French are known for refusing to accept things as they are and asking why the goal was set to begin with. Their inquisitive nature tends to disrupt and delay projects, earning them some ungracious epithets from people frustrated with French intransigence. Their argumentativeness stems from an education that prioritizes intellectualism. French students study philosophy, culminating in a self-reflective, four-hour written “philo” exam in their final year of lycée, or high school – considered a gateway to higher education. They are also taught logic, debate, and to value consistency over practicality. They will hold fiercely to their own position unless you convincingly dismantle their logic or posit an equally logical alternative. The French philosopher René Decartes (1595-1650) is known as the father of modern philosophy, and is most famous for the dictum, “I think therefore I am.” He codified the French way of thinking into a system called Cartesian logic. One outcome of this academic approach is a proficiency in theoretical and mathematical reasoning. This kind of thinking has changed the phrase, “it works in theory, but will it work in practice?” into “it may work in practice, but will it work in theory?” among French academics. Ideas, theories, and logic are important to the French.